Talk the Line Toastmasters (Club #1083068) has just celebrated its 10th Anniversary as a club. That is a big anniversary for any club, more so for Talk the Line because they are a club located in a prison. Talk the Line is recognized within District 101 as being enthusiastic and professional in the conduct of its meetings as well as presenting/delivering outstanding speech projects. The club receives visitors from District and Area Officers and clubs within the district on a regular basis. The ten year history of Talk the Line includes five President’s Distinguished Club awards and two Distinguished Club Awards as well as conducting the first Toastmasters International Speech Contest conducted within a prison. The genesis of Talk the Line was borne out of the recognition that incarcerated men had difficulty clearly, and with confidence, speaking about themselves. This is an important skill as many of the men are required to appear in front of a parole board which is stressful under the best circumstances. So it was that Talk the Line was established with 20 men and a staff sponsor. 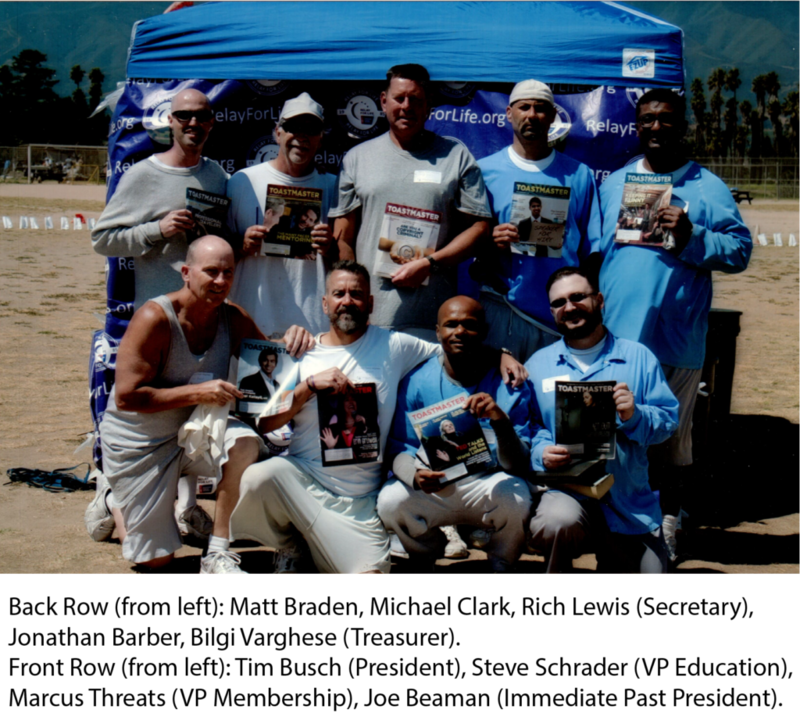 Over the years the club has grown and only one of the founding members remains in prison, the others have paroled and are leading productive lives. One of those alumni, Terrance Hunter, in the first year of his release joined a Toastmasters Club in the Bay Area and placed second in his first district speech contest and continues as an active Toastmaster. The club is recognized for the development of its members as good leaders and motivating speakers. This has resulted in many of the members being selected for leadership roles in other self-help groups within the prison. The club is also recognized for promoting the continued education for everyone and community service. The club is currently working with Steinbeck Toastmasters and the administration of Palma High School to establish a Gavel Club. The club does face challenges that are unique to its locale. There are times when scheduled events and/or meetings are changed or cancelled due to issues within the prison. There is also the issue of semi-annual dues. All clubs face this and it is always a struggle. Talk the Line faces additional challenges as the average hourly rate for members is approximately $0.15 with many members only assigned 100 hours per month. In addition there are those with restitution which taxes their earnings at 55%. This results in a member who works 100 hours earns $15.00, after the 55% restitution deduction the member is left with $6.75. That is where the difficulty lies but nothing is insurmountable. Some of the members receive support from their family and others support members within the club. The challenge for the club leadership is to ensure that enough members have paid to maintain club currency. Talk the Line will continue to evolve. Older members serve as mentors and the turnover of members and club officers breathes new life into its operation. The club continues to maintain its high standards and looks forward to another ten, twenty and even thirty years. The skills developed within Toastmasters and their application by our alumni serve as motivation for current members to continue. Rich Lewis is a former Marine serving a life sentence. Mr. Lewis has served as the Secretary for Talk the Line Toastmasters for the past three years. Mr. Lewis is working towards his DTM and has completed two of the four requirements for the Advanced Leader Silver Award, the last step. The California Board of Parole Hearings, after over 29 years of incarceration, found Mr. Lewis suitable for release on parole in February, 2018. He is currently waiting for final approval from the Governor and is planning on paroling to the Los Angeles area. He is looking forward to joining a Toastmasters Club upon release.